Doom Patrolers have a very Merry Christmas! Keep warm, enjoy any time off from work you get and thanks for checking in. I'll be back hopefully over the weekend for a post or two. 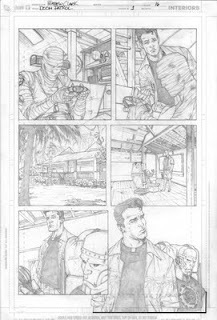 Until then, here's some pencils (and inks!) 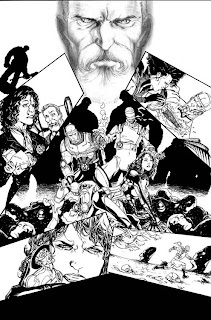 from Matthew Clark for the last page of the last issue. Yeah, it kinda is a re-gift (Thanks Matthew!!! ), but would you have seen it elsewhere? Only here, Patrolers, only here. Two dozen Negative Mondays already? Sheesh. Imagine where we'd be if I actually kept a regular schedule! Negative Monday, today, is going to focus on the Negative being(s?) 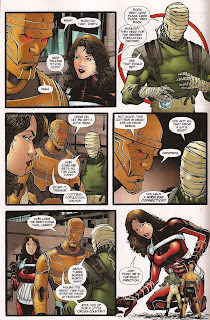 in the most recent issue - Doom Patrol #5. 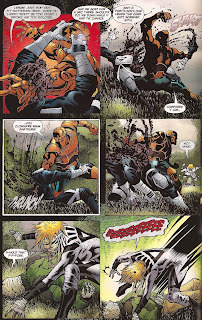 Giffen could have gone in so many different directions with the Black Lantern DP going against the living, but he decided to put the seemingly logical connections together. 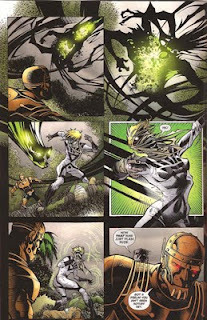 In this case, Larry Trainor was challenged by the reanimated Val Vostok, who, somehow, brought along a semblance of the negative being with her. 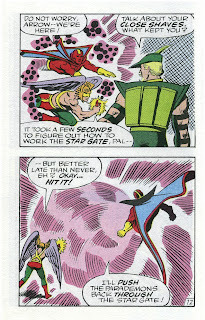 The static between Vostok and Trainor is nothing new - Kupperberg touched on this in his take way back in Volume 2 - but here, Larry exerts his control of the negative energy in a surprising manner, especially considering "Vostok" took Larry out in a hurry in the last issue. Rather than blather on, I'm going to share the confrontation with you. Read on to see what happens when two Negatives enter into the equation. 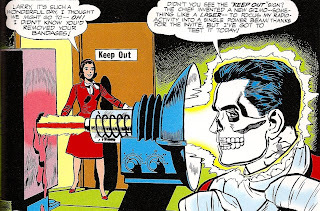 Larry maintains his personality all the way through, even as Black Lantern Vostok seems to have the upper hand. 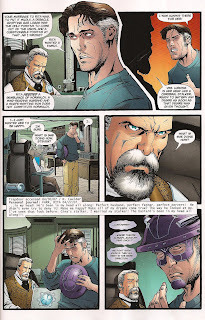 I quite enjoyed the Blackest Night issues. 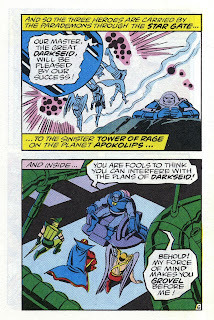 Sure, it is a little disappointing that the DP couldn't wrap up the challenge in these pages, but it appears as though the Patrollers - with Cliff not really registering in the Black Lanterns emotion spectrum vision and Larry single-handedly defeating one of the Lanterns - might help turn the tide and win the war against the Black Lanterns. 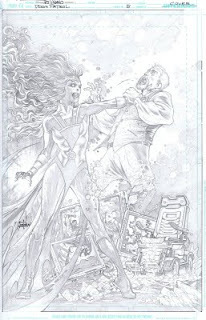 I guess we'll find out more about the DP and their involvement in this struggle on December 30 with the release of Blackest Night #6. 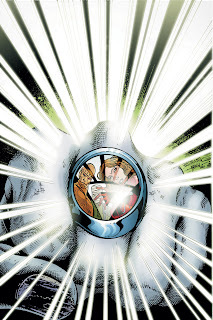 So the second issue of the Blackest Night crossover is here and gone. 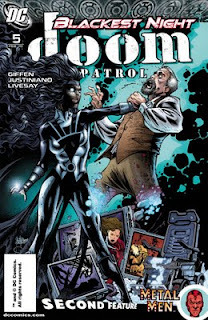 I reviewed it for Comic Book Resources, so here's a link for that. 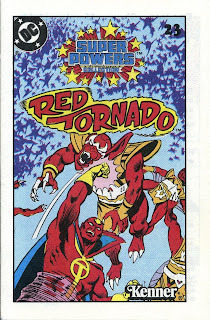 I didn't say so in my review, but to me, this issue is worth the price of admission for the cover alone. 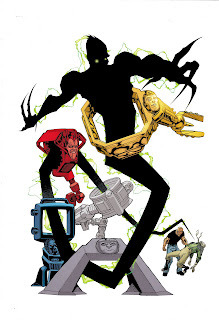 Of course, next issue's Maguire-inspired, Matthew Clark-drawn cover is just as worthy. If you're not feeling linky, well, here's a small excerpt. 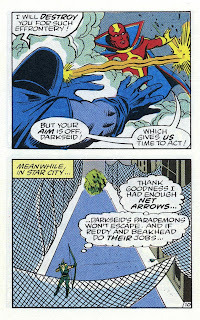 Giffen handles the "Blackest Night" crossover delicately. 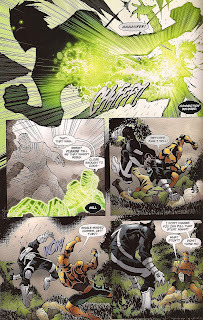 In these pages, the encounters with the Black Lanterns are loud and gory, but the conclusion to the Black Lantern story doesn't happen here. 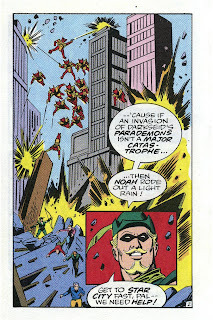 Apparently it'll happen back in the main pages of "Blackest Night." 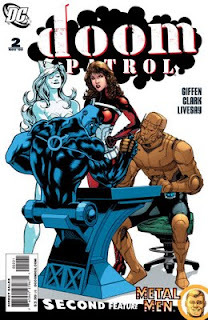 To be sure, some readers will cry foul over that decision, but in doing so, Giffen focuses on the Doom Patrol and their dead demons and closet-based skeletons. Rounding out the Doom Patrol part of this title is a teaser page that is handled like a movie poster. 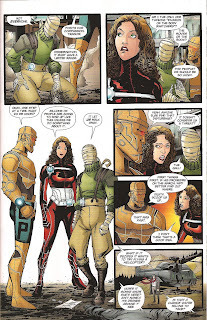 A nice fun way to wrap up this issue and entice temporary Doom Patrol readers into coming back next issue. Tomorrow will be another Negative Monday (which won't be negative for me at all, as I'm taking a day off from work!) and Tuesday I've got another nice little surprise for you. Beyond that, well, let's just see what happens together. You guys are so kind and patient. I'm recovering nicely, work is getting back on track, housework is shaping up, so I've got a bit of spare time to dedicate to this blog. Spare time and something cool to share. You may have seen, you may not have, but here's a link to Popfunk.com, an online store with only the most uber-cool apparel. 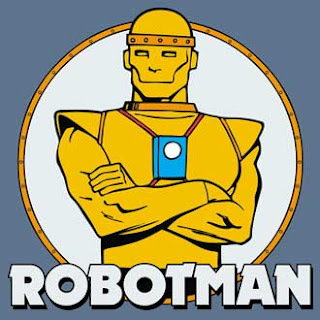 Including a Robotman t-shirt. 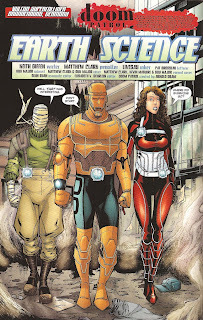 Aw, yeah, Robotman! 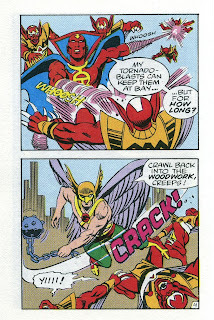 The art looks like an extremely enlarged image (that was enlarged so much it lost all of the Pérez-panache) from George Pérez's Teen Titans run to me. What do you guys think? At any rate, there's a wonderful idea for your favorite DP fan, who just may happen to be yourself. I promised it a bit ago, and here it is: four more questions - complete with answers! - from Matthew Clark. Well, the questions are from me, then answers are from Mr. Clark. Without further ado, read on, Freak Fans, read on. MGA: What was the first order of business once you came onto the title? Was it character designs? 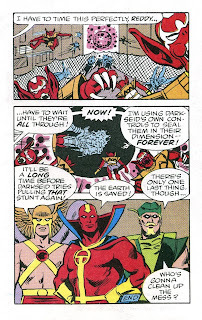 Talking to Giffen about who should and shouldn't be in the book? Running around the house, screaming in sheer joy? MC: My first thought was to just do some sketches not with the intention of re-designing them just start drawing them and let them come about organically. Then a chat with Keith about his intentions, along with general ideas. 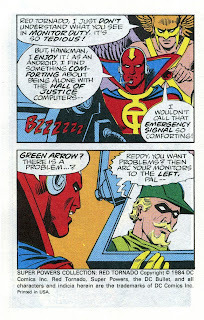 Then back to the drawing board, I knew after the chat and meeting with DC during a con about the approach. I asked to tweak the core group. 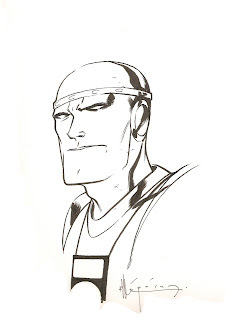 Robotman I wanted to get closer to the BP [Bruno Premiani] look but still add a bit of my flavor. Negative Man I ditched the trench coat I wanted him to stand out more, and Rita, after the talk she needed a full body suit. More on that later. From my opinion the new designs need to reflect their origins and personalities/vocations of who the were. So when I did Cliff's new look I needed something that said "sportsman" and the biker shorts did just that. Larry was a test pilot so he need to look like a flyer. Rita was a bit tougher because she was a actress so her look when I was doing the inital sketches were that of a silent film star. 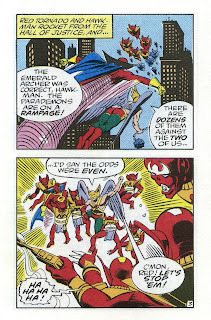 But after a bit I couldn't make it work, then I was watching The Avengers with Emma Peele and it just clicked for me. MGA: We've seen some of the character designs and sketches on your MySpace, what is your creative process surrounding coming up with a character's look? Any more concepts you want to share (I'm thinking additional designs of characters John Q. Public has already seen, not any spoilers, unless you prefer it)? MC: Nothing I can share at the moment. First thing is I established a sense of past with the look of the book. All the characters designed for the book are from different periods in time. Cliff, if you look at the concept of the piping design on his face and chest, is very much in the 50s style Rita is loosely the 60s female spy. Larry is a 1914 RAF pilot. Dusty, the pilot for the team, is the Red Baron. The Chief is turn of the century Edwardian/Steampunkesque. Cale's main Body guard, Colt - seen in issue #2 - is a French Soldier from 1812. So on and like that so when I get the script or when Keith and I talk about someone new I try to come up with an era to base the look on. Once that is decided then I check for reference and begin the research. I'll start to send off designs to Keith and Liz [Gehrlein] to get comments. I'd send a image of a returning character [ to me - DZ] but that would spoil things. 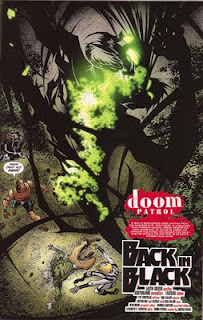 MGA: If you were completely in charge of this title, what Doom Patrollers would be on your team? 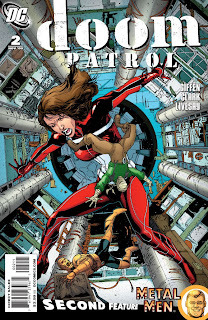 Anyone you would add who hasn't been a Patroller before? MC: I have all the Patrollers' I've been wanting to draw. I'd add Beast Boy, but I understand why we don't have him. He was a part timer in the original series along with Mento and that's what he'd be in our book and he's a Titan now, so let him shine there. I'm sure he'll be in our book soon. 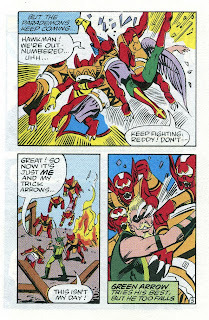 MGA: How has working with Keith Giffen on this title been? Does he give you room to breathe a bit? MC: It's been a complete pleasure working with Keith on DP. I'm not just blowing smoke. This has been a dream come true for me. 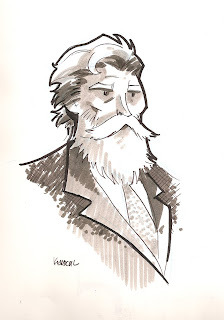 I'm a fan of his from way before I wanted to draw comics. I have a similar sense of humor and he's very open to my ideas. He wants the artists that work with him to give him suggestions and input. Heck, I sent him a design and the next thing I know she's [the character Clark designed] front and center and he added a bit to who she is and her background. He didn't have to, but Keith saw something in the design that worked for him. 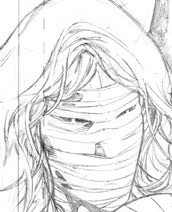 The character is Porcelain Doll and she makes a cameo in issue #5. 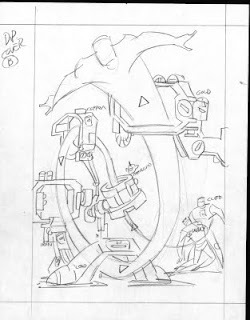 We went so far as to have Keith do layouts like the old JL book with J.M. 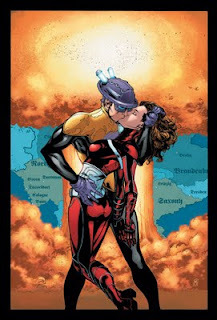 [DeMatteis] and Kevin [Maguire]. 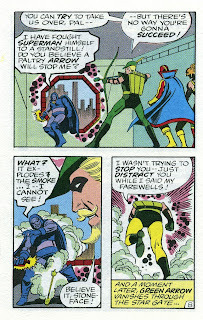 I want DP to have a Giffen flavor. He loves these characters and I want that to reflect in the book. We love these characters too! Thanks again, Matthew, for more fabulous insight! OK, so this one's gonna be short and sweet. I was sick. I'm getting better. More later. What? Not good enough? OK.
November 9 was the start of the busiest week I've worked at my current job. Throughout the week, I was wearing thin, and by Friday I was done. I cashed out and hit the hay by 8:00 Friday night. Went to the doctor the next day and was diagnoased with the flu. Turns out it was H1N1, as the "seasonal" flu has yet to hit Michigan. From there, I spent Saturday, Sunday, and Monday in bed. Woke up long enough Tuesday to know something wasn't right and my lovely wife decided to take me to the hospital. Three IV bags, one antibiotic bag, and a painkiller that could have stopped an elephant's toothache, I went home, with a new diagnosis - pneumonia. So I've been a little under the weather, which has been unseasonably mild for Michigan - and should be back in action soon. In the meantime, I'd like to mention that the Blackest Night issue of DP sold out and a second printing should be hitting shops this week. 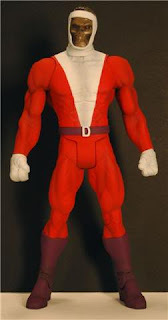 Also worthy of a mention, Mattycollector.com has the Justice League Unlimited style DP figures for sale. Haven't ordered mine yet, but soon. I'll track the process here for everyone's edification. Also to keep you coming back, I've got the second part of my chat with Matthew Clark coming up. Glad to see you all got along nicely while I was gone. Some advice was asked, given, and appreciated. Good times. This may not be the most frequently updated blog out there, but the folks here are nice and friendly-like. Makes me happy. From The Fwoosh, here's some images of the Negative Man figure from the yet-to-be-formally-announced DC Universe Classics line. The Fwoosh, in my opinion, tends to be a little out front of the announcements as the happen. 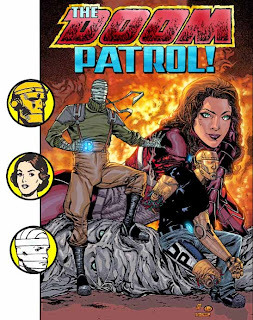 Action Figure Insider is my preferred site of choice for news on all things plastic, but this is some great news for Doom Patrol fans. 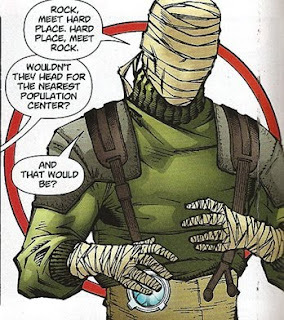 and our very own Negative Man. From what I gather, Larry is going to be the variant, with his "negative face" showing. 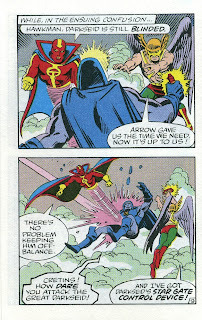 The collect-and-connect figure here will be Trigon. 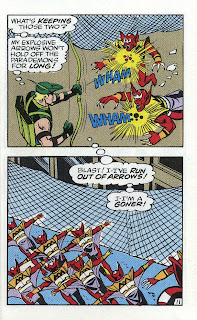 After all, they have to string us a long a little farther before they give us Rita, right? 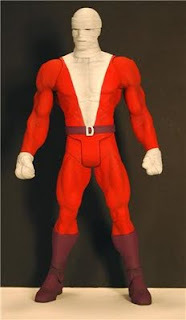 I'm a little puzzled by Mattel's choice to go retro with the appearance of Larry Trainor, as I think Matthew Clark's design is top notch and would make a more dramatic action figure. Who am I to complain? 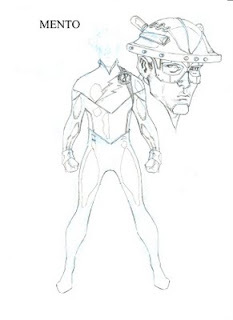 At least we'll be getting a Negative Man action figure! This one's going to be quick. 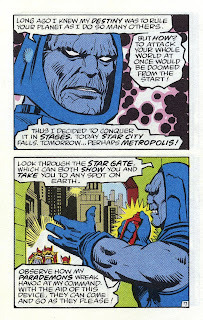 I just wanted to share a link to another lovely Doom Patrol blog out here on the interwebs. If you've read any f the comments that are wonderfully added onto the blog posts here, you've undoubtedly seen - and most likely been enlightened by - posts from a kind soul who goes by "pblfsda". Rather than try and pronounce that one, I've jumped to the conclusion that "we're all friends here" and referred to this kind soul as "PB". At any rate, PB has a blog of his (her? 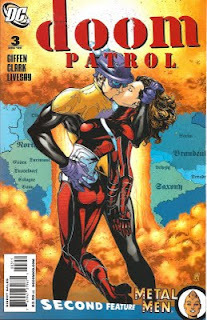 sorry PB, we've never clarified) own that discusses the Doom Patrol in significantly more detail than some of my blurbs. PB has broken the history of the DP into eras and discusses each ont he site. I've found this to be greatly informative and defintely worth more of my time. No doubt about it, PB has a passion for this band of freaks. Anyway, I've slipped once more. 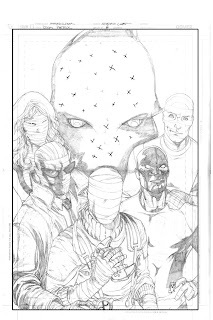 To make that to you, today I'm going to share the pencils for the cover from last week's January solicits. I'm still not sure HOW I got this beautiful image (and even if I was sure, I'm sworn to secrecy), but I think it is safe to share the pencils now that the actual cover has been shared. 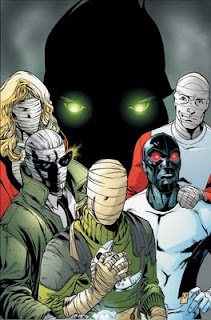 This month, we spotlight Negative Man, who’s going to knit the history of The Doom Patrol into one cohesive whole. Cohesive to him, anyway. Full January 2010 solicits for DC Comics can be found at Comic Book Resources, among other places, but CBR is near and dear to my heart. It amazes me how comfortably Matthew Clark renders all of these characters, and quite frankly, it disappoints me a little bit that we can't have Rebis and Val on the team alongside Larry. Next up, I'll be linking the DP pages from The Source. Sure, you could just click on over there, but my witty banter will still be right here.